Basically, if you have 30 Pain, you can use Soul Cleave to get the minimum amount of healing and damage. If you have 60 Pain, you can use Soul Cleave to get the maximum. If you have 45 Pain, you get something in the middle. The healing and damage are exactly proportional. You should get half of what the tooltip lists as max if you use Soul Cleave at 30 pain, scaling linearly all the way to 60. Rotationally, it makes the buttons you push regularly a little more interesting. It now matters what order you use your Pain generators and consumers, and you can choose to Soul Cleave now or do something like Shear and Soul Cleave later with a little more pain. Thematically, this change to Soul Cleave makes it act a little like it does with Soul Fragments. That is, you can choose to use Soul Cleave now, or wait a little bit and get a bigger heal. At least, that’s how Soul Fragments seemed to look in theory. I don’t think this gameplay ever worked out in practice. 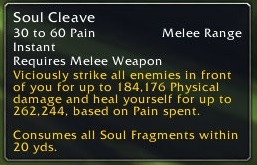 Soul Fragments are still too unpredictable and uncommon to delay a heal for, and I think Blizzard agreed because this Soul Cleave Change was accompanied by a big nerf to Soul Fragment healing. You can rely on Pain generation much more than Soul Fragments, so the gameplay of delaying Soul Cleave for a few seconds remains strong, even in practice. Even though Pain is much more reliably generated than Soul Fragments, it can be difficult to control how much pain you’re spending, since you gain a big chunk of pain from damage taken. You might push the button at 30, and actually spend 45. This wasn’t an issue in dungeons, since you usually want the healing, but I can imagine it will be less desirable in an environment where you’re regularly healed by outside sources, like a raid. If you accidentally spend 60 Pain and half of that heal is overheal, then you just wasted 30 Pain (except for the damage aspect). You might have preferred two 30-Pain Soul Cleaves that have a better chance to not turn into overhealing. However, that may be a niche case. Blizzard has said (as they always do) that they want tanks to spend more time below full health, which means we have less of a chance to overheal. Generally speaking, delaying Soul Cleave for a big 60 Pain heal is going to be the most effective for tanking, but not by a large margin. Ideally, you want to be efficient with the global cooldowns you spend on Soul Cleave, because an extra GCD means an extra Shear. However, if you need healing quickly, it’s going to be more important to deliver that healing at a critical time than to wait for that healing to be extra big. Returning back to Soul Fragments and the healing nerf they received, the new Soul Cleave reveals some indirect consequences. Since Fragments provide even less healing than before, the artifact traits and talents that add effects to consuming them (Painbringer, Fueled by Pain, Feed the Demon, etc) are even more important. Conversely, the talents that generate Soul Fragments are less valuable on their own. Overall, I think this is an interesting change that adds more complexity to Soul Cleave, but I’m a little concerned about how that leaves Soul Fragments and the many talents and traits that concern them. Previous PostPrevious First Draft of the Quick and Dirty Legion Dungeon Guide is up!